It is true that Cinderella Castle is the crown jewel of Magic Kingdom, but soon two other royal families will be welcomed into Fantasyland. 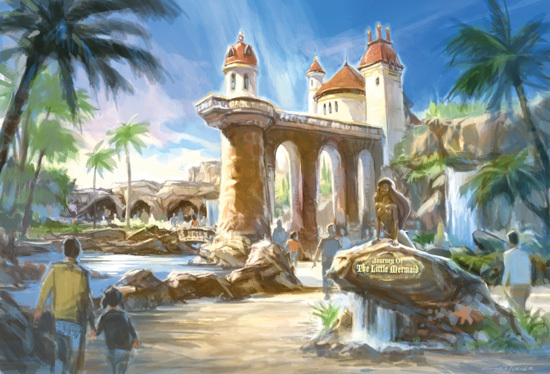 WDI (Walt Disney Imagineering) is adding Beast's Castle, where Be Our Guest Restaurant will be serving up French inspired dishes, (dining reservations will taken by the end of August for end of the year seatings) and Prince Eric's Castle, pictured below. 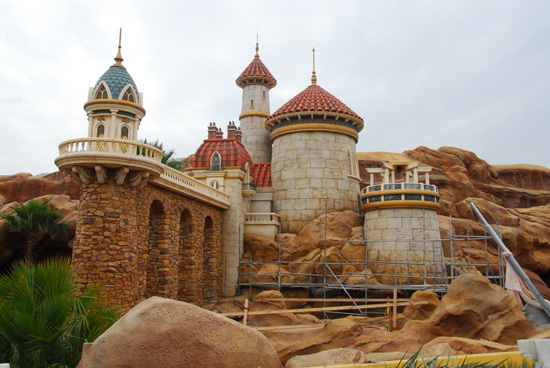 Prince Eric's Castle sits on top of the new Under the Sea - Journey of the Little Mermaid attraction. Many thanks to Disney Parks InsidEARS website for giving us this first completed look at Prince Eric's Castle last week. Both Beast's and Prince Eric's castle use the forced perspective technique for which WDI is famous to make the structure appear larger in size than it is in real life. Are you looking forward to dining in Beast's Castle? With one of my favorite dishes, French onion soup as well as one of my husband's favorites, strip steak on the menu, we'll be trying it as soon as we can. I love the dark rides in Fantasyland (and will really miss seeing the Evil Queen in Snow White's Scary Adventure), so I can't wait to see if Ursula shows up in the Under the Sea attraction. Which of the two new royal family "digs" are you most looking forward to visiting? Make sure to post on our Facebook page. It's nice to see it all coming together.